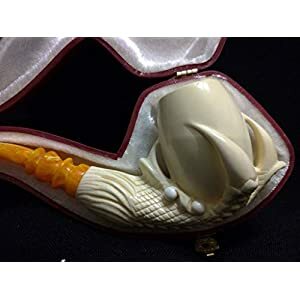 Meerschaum lined briar pipes are produced in Northern Italy and created from crushed Meerschaum stone which is then compressed into a dense block. 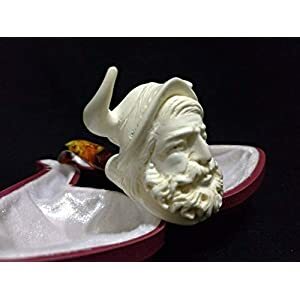 The block is then placed inside a Mediterranean Briar bowl, after which the tobacco chamber is bored out, leaving a cool absorbent lining that protects the Briar from carbonizing and helps to avoid burn-out, even when smoking plug, twist, or coarse flake tobaccos. Available in handsomely polished Tiger-Eye range, you will enjoy the coolest, driest smoking experience. 6106K – Bowl Group B. 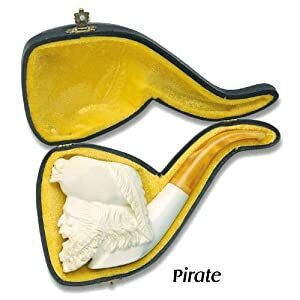 Pipe Length: 5.75″. Pipe Weight: 1.40 oz. Bowl Height: 1.50″. Chamber Depth: 1.25″. Chamber Diameter: 0.75″. Outside Diameter: 1.50″.